The year is again coming to a close and the new year has many little nuggets to offer. 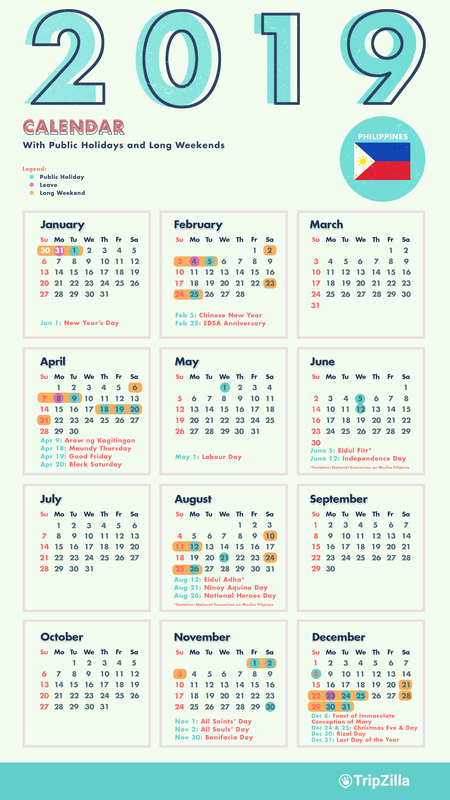 There are 10 long weekends for 2019 here in the Philippines and we are here to give you tips on how to stretch those holiday weekends so you can get the best R & R possible with a little planning. Take a look at the summary of long weekends below. *Note: The muslim holiday Eid'l Fitr is a little bit hard to predict because it is usually announce very close to the date. So it may or may not fall on the date shown. Let this be your guide for filing those vacation leaves. If you file your leaves on the dates shown in purple, you can combine your weekend, the holidays and your leaves to maximize a rest and recreation holiday. You can go to your favorite island like Boracay and enjoy 4 or 5 or even 6 days of blissful respite from the stress and drudgery of work. 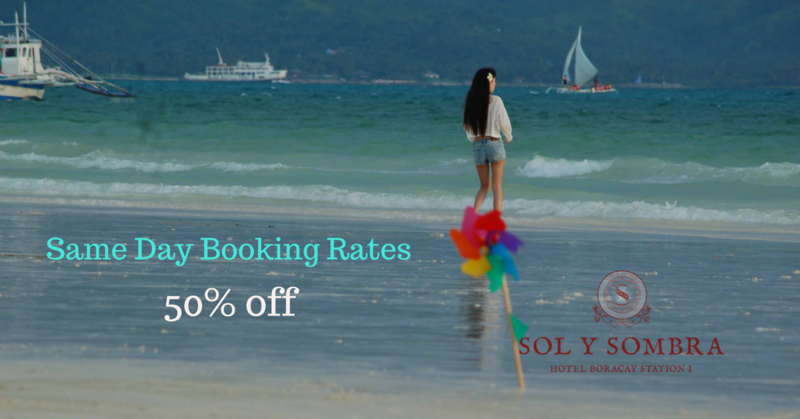 Whether you want some alone time or a chance to bond with family or friends, Sol y Sombra Boracay Hotel has the perfect room for you. So go to you HR right now, ask for those leave forms and pick your holidays. Start looking for great deals on flights. Fly in early and fly out late to make the most of your holiday. Then check with us for any special rates on your vacation dates. Holiday the smart way and come back to work tanned and refreshed like a boss. If the room you want to book is still available on the same day or a day before your intended stay, you can book your room at 50% off. No codes required. Get 50% off. You can book up to 2 nights at a time. If you want a longer stay, wait until the day before, if the room is still available, you can book 2 more nights. It's a gamble, but if you're feeling lucky, take a chance to get a really awesome deal. Take note the best dates will always go to the earliest bookers, but if luck is on your side, you might just get what you want for so much less. Family Room Package (PhP 2,845.00 per night) for 4 guests plus PhP 350 for additional guests up to 8 guests. Double Room Package (PhP 1,995.00 per night) for 2 guests plus PhP 350 for additional guests up to 4 guests. Standard Room Package (PhP 1,745.00 per night) for 2 guests. Family Room Package (PhP 3,345.00 per night) for 4 guests plus PhP 350 for additional guests up to 8 guests. Double Room Package (PhP 2,495.00 per night) for 2 guests plus PhP 350 for additional guests up to 4 guests. Standard Room Package (PhP 2,245.00 per night) for 2 guests. Family Room Package (PhP 3,845.00 per night) for 4 guests plus PhP 350 for additional guests up to 8 guests. Double Room Package (PhP 2,995.00 per night) for 2 guests plus PhP 350 for additional guests up to 4 guests. Standard Room Package (PhP 2,745.00 per night) for 2 guests. These package rates are only available for stay at Sol y Sombra Boracay Hotel on the inclusive dates 13 December 2016 to 31 December 2017. Booking period is from 113 December 2016 to 31 December 2017. Breakfast is not included with the NEXT DAY BOOKING RATE package. You may opt to add it for an additional charge of PhP 230.00 per breakfast per day. This rate is available for direct bookings only and is available exclusively through direct bookings on Sol y Sombra's online booking page, Facebook Page or through phone or email bookings. This package is not available on any other online channels. You can only book a maximum of 2 days at a time. Bookings in excess of 2 days will be charged at public season rates. This rate can only be used on it's own. If you are qualified for other discounted rates we will give you the best possible rate. This is transferable but non-refundable and non-rebookable. Booking must be paid in full through PayPal, Online Credit Card payment (5% Online Payment Charge applies) or through Bank Deposit or in cash immediately upon check-in. Airport Transfers for arrivals will be booked on a best effort basis, given the limited lead time of the booking. Guest must provide the complete flight details at least 24 hours prior to stay or date and time of departure. Additional charges will apply for transfer booking. You may also book by email. Remember to put Same Day Booking Rate in the subject of your email. To book online, enter the date today or the date tomorrow and book up to 2 nights, and if the room you want to book is available, the discounted rate will appear on the booking page. Enter the number of people you are booking for and indicate the method of payment. The rate will only be visible if the room is available on the qualified dates. The package will appear as shown below when booked on 13 December 2016 for check out on 15 December 2016. Rates effective 13 December 2016 to 31 December 2017. Some sun protection creams are harmful for baby corals. An ingredient in some commercially available sun block products called oxybenzone was found to have a toxic effect on baby corals. You may not think it, but up to 6,000 tons of sunscreen find it's way into coral reefs annually. So chemicals in the sun screen you use can have a great impact on the reef's ecosystem. Fortunately you can do your part in preserving our reefs. When buying your sun block, choosing one with zinc oxide and other alternative ingredient to oxybenzone can reduce the damage being done to the corals. If you love sea life like we do, check the label. Make a mindful choice to protect our precious coral reefs. After all we're all in this together. 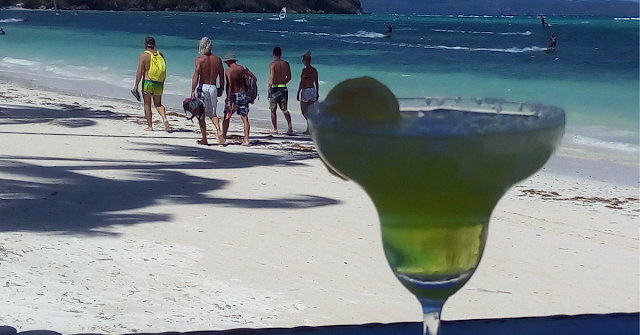 Sol y Sombra Boracay Hotel is launching it's first version of the Online Booking Page. Check our room availability in real time. You can now also book and pay online instantly. Book a room, pay via Paypal or credit card and get instant confirmation. And only for bookings in March you can enjoy big discounts. Book Now! Sol y Sombra Boracay Hotel (c) 2015. Simple theme. Powered by Blogger.